If you’ve made the decision to move forward with a custom logo design for your business or organization, then you’ve come to the right place. Sumy Designs can create a logo that will set you apart from your competition. A logo takes time and effort to create, but a well-designed logo will give your business the appearance of being credible and professional. We created a logo for the Child Care Marketing Association and they were glad to let us use their logo and design progressions to demonstrate the different stages of designing a logo. We need to know more about you and what you need. We’ll ask you questions like “What is the target audience for the logo?” and “What is your competition?” “Where will the logo be used and in what scale?” A logo for a business card only might be completely different than one that will be predominantly featured on a billboard. Answers to these types of questions will let us move forward with a particular style in mind. We will also ask for details regarding color and font preferences. Child Care Marketing Association needed a logo that was primarily for website and small print designs. They requested clean fonts and a graphic element that represented children or education – something like a handprint, a book or a small tree that symbolized growth. They were also not sure if they wanted to use the initials CCMA but were open to seeing concepts of the idea. They were also open to many color options but mentioned they favored the colors blue, green and yellow. During this phase our designer creates some sketches to get the ball rolling. Sketching the initial concepts is critical in the creative process and promotes ideas that can turn forms into visual symbols. 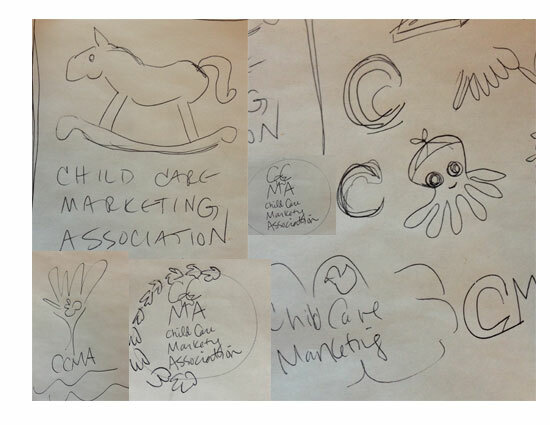 Here are the sketches from Stage 2 of the Child Care Marketing Association design process. The sketches are then turned into digital representations and drafts are produced for the customer. 5 or 6 concepts are presented and the customer will choose their favorite concept. Here are the six concepts Sumy Designs presented to Child Care Marketing Association. We presented several that met the needs of their specifications but we also presented a few ideas that were different but still met the criteria for the feel of the logo we thought they were trying to express. The client will pick their favorite logo and provide feedback. After we gather the information we begin the refining process of the final logo design. This can be one of the longest and toughest stages because it involves a lot of back and forth correspondence regarding minor changes in design, fonts and colors. Our client picked concept #1 from about but requested to see the version with several different font changes. Once the logo revisions are finalized we create the end product for the client. We then create multiple file formats for web and print that are delivered to the client. Are you ready to take your business to a new level? Sumy Designs can help. Contact us today about a logo designed specifically for you.